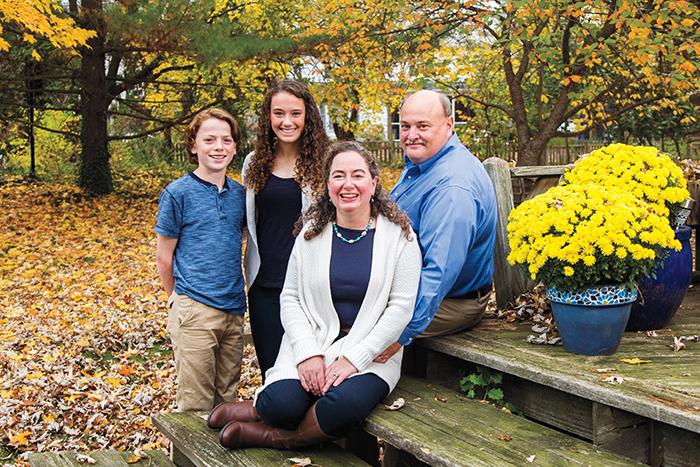 Government administrator Colleen Mahony ’87 with her husband, Eric Christensen, and children, Sean and MacKenzie. Finding great child care. My children were loved and exposed to so many more things than I could have done with them as a stay-at-home mom. We all need to advocate for more quality child care and early childhood education for children regardless of our place on the income spectrum. Having a parenting partner who truly shares the workload. When one child was sick, my husband and I would determine who had the more important meetings that day. Finding an employer who allows you to be involved in your children’s school activities is key. I still got to go on school field trips or volunteer in the children’s classroom experience. Life is never boring as a parent, and there will always be constant challenges in the work/life balance struggle. Juggling it all is part of the adventure.